What originated these “lignes d’erre & randons” were sounds collected in different and special spaces which have been important to me. These sounds, trapped into my remembrances, had no other choice than mutate and evolve, drawing subterranean flows and creating a genuine underworld of recollections. Secrets. Hidden places. Unnamed memories. This is what is known of Kassel Jaeger ‘s Lignes d’erre & Randons. 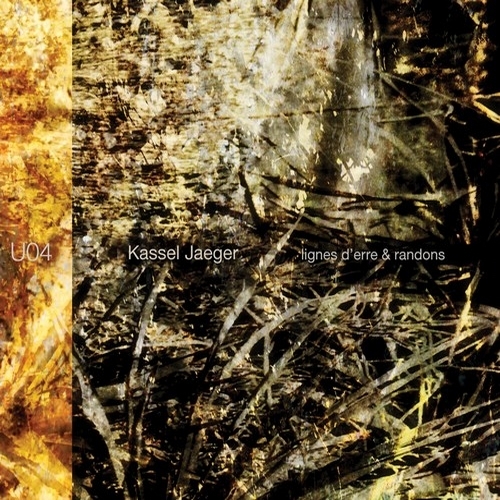 Furthermore, the name Kassel Jaeger itself is a fiction — a pseudonym employed by a Parisian composer who claims membership at GRM. I’m not sure what I’m supposed to make of that, or if I’m supposed to believe it. The composer teases with the notion that the source sounds for this electro-acoustic album originate from places that are important to Jaeger, whoever this person may be ; and he (or she) declines to state what is so important about those sites. In keeping with the modus operandi of many who work with field recordings into composition, Jaeger presents a disjunct between the way those places might have actually sounded and how he remembers those sounds. Hence, the sound/thought/concept/whatever has become abstracted by emotion, history, context and the fallibility of memory. Here’s something a Proustian endgame in the willful slippage between remembrance and forgetting. Throughout this conceptual framework, Jaeger presents a network of artifacts : some digital, most environmental. The opening track — “Windshore” — moves through a repeating series of inhalations and exhalations, snipped from that bank of aforementioned field recordings and reconfigured into something that resembles human slumber. The filigree of digitalia is draped across many of his field recordings, but the mixture of the digital glitches with the unpredictability of the natural world is an attempted emulsion of oil and water. Such is the case for “Nocturne” with its elongated resonance from what could harken from the innards of various metal pipes layered with a zombified half-melody tuned from cable buzz and various CPU fizzing. These sounds may be mixed in the same audio space, but each retains its own separate course of action independent of the other. Through the gurgling and creaking of an object being worked through a muddy embankment (or something that sounds very much like such a place) on “Dispersion des Limbes”, Jaeger offers a bit of history lesson looking back to the work of GRM alumni Luc Ferrari and Michel Chion, with much more of a psychogeographical take on concrete strategies.